On April 7th, 2017, Minnesota Governor Mark Dayton signed a safe digging proclamation to help focus public attention on this issue. Mike Mendiola with the Minnesota Office of Pipeline Safety (MNOPS), a professional in the underground damage prevention industry, arranged the signing. 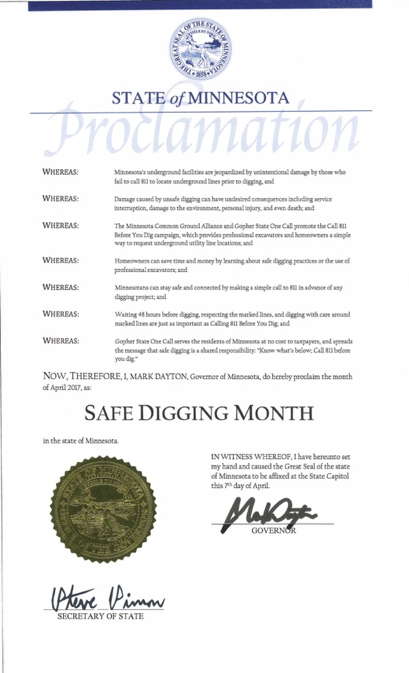 The proclamation encourages everyone to contact Gopher State One Call (GSOC) at least 48 hours, excluding weekends and holidays, before any excavation project to prevent damage to underground utilities, injuries, and the disruption of essential services. In recognition of NSDM, GSOC partnered with the Minnesota Regional Common Ground Alliance (MNCGA) and the Minnesota Office of Pipeline Safety (MNOPS) to host 32 damage prevention meetings around the state that emphasized the need to practice safe digging, which starts with a “call or click” to GSOC. In addition, GSOC offered ITIC training webinars every Wednesday in April to help train excavators on the online ticketing tool that is available to them. Read more to see what our damage prevention partners across the country did to celebrate NSDM in their respective states. On May 22-23, 2017, Gopher State One Call (GSOC) will host a two-day Locator Certification Seminar (LCS) taught by a Staking University (Staking U) instructor. Founded in 1999, Staking U established the first year-round training program to educate and certify locators on locating equipment and best practices. Skills to help them consistently provide accurate and complete utility locations. 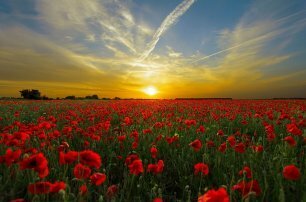 April is an important month in the damage prevention industry. Since 2007, the U.S. House of Representatives and Senate has recognized April as National Safe Digging Month (NSDM), which makes 2017 the 10th anniversary of this significant acknowledgment. Throughout April, Gopher State One Call (GSOC), the Minnesota Regional Common Ground Alliance (MNCGA), and the Minnesota Office of Pipeline Safety (MNOPS) will be participating in damage prevention meetings offered around the state to emphasize the need to practice safe digging, which includes a “call or click” to GSOC. These educational opportunities are available at no cost for all stakeholders in the underground utility industry. MS216D Stakeholder Review meetings will be held throughout 2017 to allow stakeholders in the Minnesota underground utility community to come together and provide feedback on the state’s current one call laws. The Minnesota Of ce of Pipeline Safety (MNOPS) holds these meetings to initiate discussions about stakeholder desired changes to the law during the 2018 legislative session. Gopher State One Call (GSOC) encourages all stakeholders to participate in these meetings to provide valuable input towards the continued effort to keep our underground infrastructure safe.